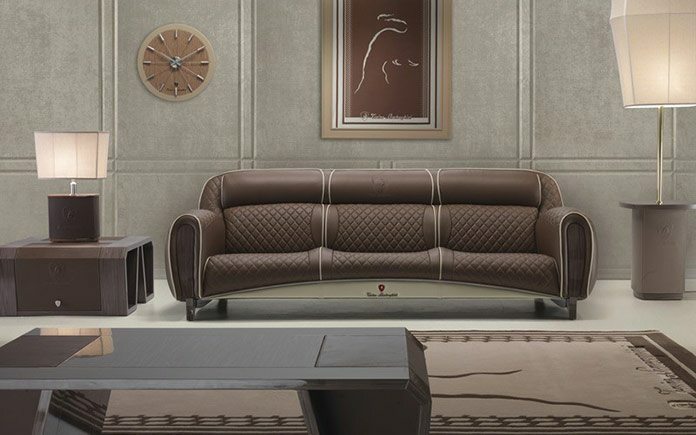 Since 2005, the Tonino Lamborghini brand has been linked to the Formitalia Luxury Group, expanding the range of collections of dynamic furnishing elements for the home and office covered in vibrant, brightly colored leather, naturally inspired by the world of high performance sports cars and mechanical engineering. United under the emblem of the raging bull, Formitalia Luxury Group and Gambarelli present at Salone del Mobile new Tonino Lamborghini design collections, inspired to the life style of the Italian brand that for more than 30 years is synonymous of luxury and Made in Italy all over the world. In Milan, Formitalia presents a collection of design furniture and accessories, ranging from the upholstery inspired to the roaring volumes of the cars of 60s to complete systems for offices, hotels and luxury epicentres. Gambarelli has developed the Tonino Lamborghini Tiles & Style line that includes collections of ceramic wall tiles for every room, inspired to the most important F1 circuits. At Salone del Mobile Formitalia and Gambarelli translate the Tonino Lamborghini world in design shapes, surfaces and volumes to express, through new living spaces, the style and the passion of the luxury Italian brand. Characterized by unique style that outlines all the home collection by Tonino Lamborghini, the new three-seater sofa Sepang looks audacious and gritty thanks to the covering of the seat and back in leather Alpine Racing Red. Even the rigid structure is completely covered in leather Carbon Red with frontal mask in black glossy finish. Leather cushions coordinated. Delicious for its rounded shape, the new armchair Sepang, perfectly coordinated to the sofa, has a coating that uses three particular types of leather declined in red and black version. Alpine Racing Red, Alpine Traforato Racing Red and Carbon Red for red model; Black Alpine, Alpine Perforated Black and Carbon Black for the black model. Swivel metal base color glossy black. Very elegant and impressive the new deskt signed Tonino Lamborghini. It shows a structure in veneer Noce Canaletto glossy with frame and central writing part in sophisticated leather Vogue 6016 Moka. Measurements: 296x109xH.78. Coordinated at the desk the Long Beach presidential armchair covered with leather Vogue 6016 Moka and Vogue 6016 Moka Traforato. Metal swivel base with wheels. Measurements: 86x70xH.136 / 146. Uncompromising spirit, Italian ingenuity and design – together with the talent of a brand recognized throughout the globe as a beacon of luxury, exclusivity and Italian flair – are the values of the Tonino Lamborghini brand. The Group’s vision is to bring the passion and spirit of Italy to the global market with unique and distinctive products, inspired by Italian industrial design and the Lamborghini family mechanical heritage.